When I met Paula at the first Kosher Bloggers Conference, I introduced myself so I could rave about her recipe to the source. We schmoozed, talked shop and discussed how we might work together one day. Paula is visiting Israel soon and I am excited to be working with her on the publicity for the trip and a special event with the spouse of the US ambassador in Israel, Ms. Julie Shapiro. Paula is on a constant book and food demo tour and has a new book coming out in 2 months (The New Passover Menu, Sterling Epicure) so I appreciate that she took the time to be part of 8 for 8! Paula’s latest book. A new one for Passover 2015 is coming out very soon. Paula, besides growing up in the US, you have also lived abroad. What stands out for you about celebrating Chanukah in the US and in other countries? Any special food memories? Chanukah in the US is about latkes and in other places it is about donuts. Even in Geneva, Switzerland, we got sufganiyot from the local kosher bakery. I will never forget spending Chanukah in the hospital in the US in 1999 when I was on bed rest waiting for my twins to be born. I lit candles in my room every night and prayed that my babies would be healthy. One was 7 pounds at birth- pretty much our own Chanukah miracle. We have often had combined chanukah/birthday parties for the boys. How has your Chanukah changed since you became a chef and author? Before I was a chef, Chanukah was just about latkes, As a chef, the world of possibilities has opened up to me. I make different flavors of latkes and apple sauce, experiment with different flavors of dough and fillings for donuts and even developed desserts baked with olive oil. How does your family celebrate Chanukah? We love to sing so we make sure we all light candles together every night. We get together with friends and family, if possible. My mother buys great gifts for the kids that they wear right away, like snuggies and bathrobes. Rehearsal before Paula was featured on Hallmark Home & Family recently. What are you eating for Chanukah this year? Every year we try something new. I am working on chocolate flavored funnel cake and cannoli donuts this year. What are the top questions people ask you about baking for Chanukah? For other holidays? People are afraid of yeast doughs and afraid of frying so I get a lot of questions. I get emails with questions up to an hour before every major Jewish holiday. They are usually about ingredients or equipment people do not have. But sometimes people change my recipes and write to ask me why the dessert does not taste good. What is one dish you must eat during Chanukah no matter what? Potato latkes fresh out of the frying pan. Latkes – I am surrounded by sugar all day every day and I just crave salty food. My Almond and Olive Oil Cake. It is perfect fit for Chanukah with the olive oil, yet not the usual dessert. Enjoy! The use of olive oil in cakes dates back farther than the Chanukah story itself. Olive oil was used in baked offerings at the Temple. This is a super easy teatime cake that reminds me of simple cakes I have eaten in Italy. If you are feeling decadent, serve this with whipped cream. PREHEAT OVEN to 350°F (180°C). Trace an 8-inch (20-cm) round pan on parchment paper and cut it out with scissors. Grease and flour the pan, press in the parchment circle; and grease and flour the top of the parchment and sides of the pan. Sprinkle and spread the sliced almonds on the bottom of the pan to cover it. IN A MEDIUM BOWL, beat the sugar, eggs, and olive oil for about one minute at medium speed until creamy. Add the flour, ground almonds, baking powder, salt, almond extract, and orange zest and beat until combined. Pour the mixture over the sliced nuts. Bake for 35 minutes, or until a skewer inserted in the middle of the cake comes out clean. LET THE CAKE COOL in the pan for 10 minutes and then run a knife around the sides. Turn the cake onto a wire rack and let it cool. Serve the cake almond side up. Store it covered at room temperature for up to four days or freeze for up to three months. A recent article claimed that Jews who keep kosher have all become “foodies”. If there is one person to credit for kicking off this phenomenon, it is probably Levana. She brought upscale kosher dining to NY when the stereotype and expectation of kosher food was that it was deli food. And while there is nothing wrong with great deli, Levana showed everyone that there is much more to kosher food than ethnic food. Here restaurant (called, surprise, Levana) was a game changer for NY kosher restaurants. Today there are many fine kosher restaurants in NY, Levana set the standard. Open for decades, serving food people loved and looked forward to, Levana introduced many to new foods, warm hospitality and higher standards. Since then, Levana has been very prolific and published a number of critically acclaimed cookbooks as well as speaking, doing food demos and educating widely about how delicious recipes can also be healthy and relatively simple to prepare. She is a woman with a mission and quite busy, so I am super pleased that Levana is taking part in the 8 for 8 celebration of Chanukah here on my blog! Levana, do you have memories of celebrating Chanukah in Morocco? What are some highlights? Any special food related memories? To be frank, growing up in Morocco, Chanukah was absolutely no big deal in terms of social gatherings. We made a much greater deal of Tu BiShvat and Purim, they were huge bashes. On Chanukkah, in each house, everyone made their favorite fried treat, just one night. My mom made the Arabic donuts, Sfenj. But that was about it, beside Chanukah lighting every night, of course. What do you do to create a special holiday atmosphere for your family during Chanukah? Seriously: Lots of Latkas! Homemade a must! How has your Chanukah celebration changed over the years? I have happily adopted my husband’s minhagim (customs), which include making a much greater deal of celebrating Chanukah than I ever did in the past. Lots of Latkas (not just potato Latkas), donuts, kids presents, menorah lighting at home and in public places. My son Yakov and his wife Elisheva are Chabad Shluchim in Washington Heights, which means menorah lighting in one of the Washington Heights Parks, a kids Chanukah party etc. It’s always a wonderful time to put family and friends together, and do silly stuff. We need all the fun we can get! What was it like to be a restaurant owner during Chanukah? It meant getting ready for more family reservations. It also meant always including Latkas on the menu to go with dinner, and even whole Chanukah parties with fun menus including Latkas and fritters, both savory and sweet. What are the things you must eat or do during Chanukah, no matter what? I must get all my kids and grandkids together one of the Chanukkah nights, make lots of Latkas, and a homemade apple sauce, and watch it get all devoured. Give out gifts to everyone big and small. Loving Bubbie, loving Zaidie, what do you expect? Will you please share a few Chanukah recipes with us? Happy to share! I am going to share my latka recipe plus my thoughts of “fear of frying therapy” (which you can also find on my blog). Heat 1/3 inch oil in a heavy frying pan until very hot. While the oil is heating, place the flour, eggs, onion, salt and pepper, and nutmeg in a bowl, and mix thoroughly. Quickly grate the potatoes in a food processor, and immediately stir them into the batter, making sure not to squeeze so as not to extract unwanted extra moisture. Work very quickly so they do not have time to get discolored. Form small patties, and lower them into the hot oil, or drop the batter by heaping tablespoons. Fry until golden, about 3 minutes on each side. Remove and drain on paper towels. Serve with applesauce (try my homemade applesauce: nothing to it, and it’s wonderful! ), or plain yogurt. Vegetable latkes: Replace the potatoes with a mixture of zucchini, carrots and parsnips. Add seasonings of your choice such as oregano, minced fresh garlic and basil. Sweet potato latkes: Substitute sweet potatoes for the regular potatoes, and add brown sugar, cinnamon, curry and ginger to taste. Try serving them with my Hot Pepper Jelly! Potato Kugel: That’s right: What else is it but a giant latka? Add 1/3 cup of vegetable oil to the potato latka batter. Pour the batter into a greased loaf or square pan, and bake uncovered in a preheated 375*F oven for one hour or until the top is golden brown. – Keep it dry. Too much moisture will steam food instead of frying it, yielding soggy results. Be sure to dry whatever you are frying thoroughly with paper towels. – Keep it thick. With a firm (not runny) batter, you will be able to form thicker patties, which will absorb much less oil than thinner ones. The ouside will be crisp and the center will be tender yet cooked through. – Keep it hot. Less-than-hot oil will seep into your food, making it inedibly greasy. If you are adding oil to your pan while frying, chances are your oil was not hot enough to begin with. When your oil is good and hot, you will need to add very little if any to finish frying an entire batch of food. How hot is hot enough? Drop a smidgen of batter into the oil. If it sizzles and rises to the surface, the oil is hot and ready for frying. – Keep it steady. Do not crowd the pan. First of all, you will make handling the food more difficult. Also, crowding will bring down the temperature of the oil. Adding what you are frying at steady intervals ensures that the oil has time to return to the desired temperature. – Keep it lean. I have my mother to thank for this advice. Rather than using spatulas or slotted spoons, work with two forks when frying. Lift each fried item with a fork on each side, and hold it vertically for a second or two over the frying pan: You will be surprised by how much oil drips off it. Immediately place the items on a plate lined with several layers of paper towels, which will absorb any remaining unwanted grease. – Keep it white. This applies only to potato dishes. Peeled potatoes will oxidate when exposed to air and turn an unappealing gray color. So when making latkes (or a potato kugel), get everything ready and peel and grate the potatoes last, adding them immediately to the otherwise finished batter. – Keep it fresh and hot. A word about freezing and reheating. If you are entertaining a large group, it won’t be enormous fun spending the afternoon frying while everyone is having a good time. If you must fry in advance, follow all the above guidelines, but fry each item until it is ninety percent cooked through, no more. Store it in a shallow pan in one layer. You can also place the latkas in the pan vertically, like a deck of cards; you will be able to fit quite a few in a pan in this position (again, one layer). Cover tightly. Refrigerate or freeze, depending on how long in advance you are preparing the dish. Reheat uncovered, at about 350*F, for fifteen to twenty minutes if it was frozen, until golden and crisp. We are celebrating day 3 of our effort to meet a cookbook author for each day of Chanukah with Orly Ziv of Israel. Orly offers a wonderful insight into Israel through her culinary tours and through her writing. And I really appreciate that she has agreed to join the 8 for 8 project: Eight cookbook authors for the 8 days of Chanukah! Orly is a pioneer in Israeli culinary tourism, which is all the rage these days. She is a trained dietitian who has been using her passion for the produce and dishes of Israel and the Mediterranean to introduce tourists to Israel. Via shopping trips to the local markets and cooking classes in her kitchen, Orly has helped many to fall in love with Israel and her food. After many of her visitors had said repeatedly “you ought to write a book”, she did and Cook in Israel was born. What stands out for you about celebrating Chanukah as you grew up? What about when raising a family? Any special food memories? Lighting the candles everyday was and still is our tradition every year. I have warm memories from the Levivot (latkes) my mother used to make which I also make for my children. Recipes for my different types of Levivot are included in my cookbook. The traditional ones I make with potatoes but I also like to diversify by using grated carrots as an option to enrich the nutritional value . We make time to get together every evening to light the candles and of course, to eat. I like to make the zucchini latkes recipe from my cookbook and serve them with yogurt. What are the top questions people ask you about cooking for Chanukah? For other holidays? My guests are often not Jewish and we talk about the significance of eating fried food as a symbol of the oil tin miracle of Chanukah. I am careful to explain that the Jewish holidays always involve special foods to symbolize the specific holiday. Non-Jewish people find it very interesting and different from their own culture. Finally: On the Latkes or sufganiot debate, your vote? What recipes can you share with us for this Chanukah? I want to share some of my favorites. Of course, Levivot (latkes). As people outside of Israel are increasingly aware, donuts (soufganiyot) are also a big part of Chanukah in Israel, so I am going to share a recipe for those as well. And something less traditional, Zucchini Pancakes. Enjoy and Chag Urim Sameach (Happy Festival of Lights)! Often called latkes, these Eastern European Jewish potato pancakes are delicious no matter the name. Fried foods are served on Hanukkah since the oil represents the miracle of one night’s worth of oil lasting for eight days during the rededication of the Second Temple. Grate the potatoes using the coarse side of a box grater. Put in a colander and squeeze out as much liquid as possible. Put the shredded potato in a bowl and mix with the flour, eggs, salt and pepper. Heat the oil in a wide, heavy-bottomed pan (it should fully coat the bottom of the pan). Add batter by the tablespoonful and fry on both sides until evenly browned and crispy. Transfer to a wire rack while you finish cooking the remaining pancakes. Serve immediately with sour cream or sugar. Add 1 grated onion, 2 grated carrots, or 1 grated sweet potato to the mixture before frying. TIP: Keeping the hot pancakes on a wire rack instead of paper towels keeps them nice and crispy. Probably the most famous Israeli Hanukkah food, soufganiyot are fried donuts. While they are commonly filled with jelly or other fillings, this recipe makes easy drop donuts. The cheese in the dough gives them a particularly wonderful texture. In a large bowl, mix together the flour, cheese, eggs, canola oil, sugar, lemon zest, vanilla extract and a pinch of salt. Leave to rest for about 30 minutes. Pour oil into a small, deep pot so it comes up about 7 cm. Using a spoon, make small balls with the dough. Working in batches, drop them into the hot oil and fry until golden. Transfer to a wire rack or a paper-towel lined plate. Top with powdered sugar and serve with strawberry jam, if you like. Grate the zucchini using the coarse side of a box grater. Put in a colander and squeeze out as much liquid as possible. Put the eggs, flour, salt and pepper in a large bowl and mix to combine. Mix in the zucchini, parsley and mint. Heat the canola oil in a wide, heavy-bottomed pan (it should fully coat the bottom of the pan). Form the zucchini mixture into patties and carefully put in the hot oil. Fry on both sides until evenly browned and crispy. Serve with sour cream or yogurt mixed with chopped fresh mint. It’s the second day of 8 for 8 where we are meeting one cookbook author each day of Chanukah. We are talking with Aviva Kanoff who just published her second cookbook Gluten Free Around the World. Aviva has been described as the “Indiana Jones” of cooking and there are a few reasons behind this nickname. The first is that Aviva regularly travels all over the globe. I have worked with Aviva for a few years now and she often responds to my emails with a brief “I will be in Vietnam soon” or a request to reschedule an interview since she is planning some time in Spain. Aviva is also fearlessly creative with food and art. Her cookbooks are gluten free and kosher but they are far from the usual fare one might initially expect to see in such books. So while Aviva has formal training as a chef and was a personal chef, she hasn’t placed herself into one food style. Whether it is Indian, Jamaican or French food, Aviva is passionate about sharing her food discoveries with the rest of us. In addition, Aviva is an inspired photographer and her books serve up gorgeous photos from the lands where her recipes originate. Her first cookbook The No Potato Passover was a hit because of the recipes but her photography was mentioned by most critics as well. Aviva just launched Gluten Free Around the World in San Francisco on a ship built in the 1860’s and I’m excited that she is participating in 8 for 8. Aviva, what stands out for you about celebrating Chanukah as you grew up? Any special food memories? My parents are both very musical and creative. My childhood memories of Chanukah are not as much food related as they are crafty and musically influenced. One of my fathers great joys in life is plumbing. One Chanukah he built a beautiful large Menorah out of copper pipes that we still light every year. My father also composed his own tune for Maoz Tzur that my family sings and dances to after candle lighting. You are a world traveler – where are some of the places you have celebrated Chanukah? Can you share any wild or unexpected Chanukah experiences abroad? Not to sound too cheesy, but my favorite place to be for Chanukah is at home with my family. I haven’t yet been anywhere too exotic for Chanukah because if I am traveling then, it would be home to Miami. I do have some exciting stories about shabbat experiences around the world, though :). (You can check out Aviva’s blog for more on her travels, SS). What do you do during Chanukah to create a memorable holiday atmosphere for yourself, friends or family? I enjoy the cozy lighting that the menorah brings and singing around the candles. The smell of latkes cooking doesn’t hurt either, to add to the whole homey vibe. Because of my love of experimenting with food, my latkes have become a lot more creative over the years. I love to have the traditional potato latkes at least once during Chanukah, but for me, variety is the spice of life. Definitely! Traveling has really broadened my horizons, especially as far as food is concerned. Just like meatballs or dumplings, every country has its own version of latkes. Last year, I made spinach quinoa latkes with cheddar cheese for a friends Chanukah party which were a big hit! I always need to have a classic potato latke at least once. What recipes are you bringing us for Chanukah? Every culture has its beloved fried foods. Since Chanukah foods are so connected to the oil of the Chanukah miracle, I want to share some dishes from around the world which use oil. They may be unfamiliar to many, but well worth trying for a holiday menu! In a medium saucepan, combine water, butter, brown sugar, and salt. Bring to a boil over medium heat. Add flour all at once, stirring vigorously with a wooden spoon. Cook and stir until the mixture forms a ball and pulls away from the sides of the pan. Remove from heat and let cool. Line a baking sheet with greased parchment paper. After the dough has cooled for 10 minutes, add egg and vanilla to the saucepan, and beat ingredients well with a wooden spoon to blend them completely. Transfer the mixture to a decorating bag fitted with a large star tip. Pipe 4-inch lengths onto the prepared baking sheet. Remove kernels from corncobs with a sharp knife, then place kernels in a food processor along with peanuts, scallions, ginger, garlic, and cumin and process until finely chopped and slightly mushy; transfer to a bowl. Add egg and rice flour; mix well. 3. Heat oil in a large skillet over medium heat. Spoon tablespoons of the mixture into the skillet and flatten with the back of the spoon. Cook until golden brown on both sides, about 2 minutes per side. Drain on paper towels and repeat with remaining mixture. Serve hot. In a large frying pan, sauté onion in 2 tbsp. oil over medium-high heat until translucent, about 5 minutes. Add mushrooms and spinach and sauté for 3 minutes or until fully cooked. Remove pan from heat. Add quinoa to spinach, mushrooms, and onion mixture and mix ingredients. Transfer to a large mixing bowl and combine with eggs, panko or bread crumbs, and cheese, if using. Heat oil in a frying pan. Once oil is sizzling, cooking four pieces at a time, spoon 1 tbsp. of mixture into the frying pan. Cook until golden, about 3 minutes on each side. Remove from pan and drain on paper towels. In a large saucepan, place potatoes in enough salted water to cover. Bring to a boil, then reduce heat. Simmer, covered, for 15-20 minutes or until potatoes are tender, then drain. In a large bowl, mash potatoes with a potato masher until smooth. Fold in cheeses, eggs, cilantro, salt, cumin, and cayenne pepper. Shape mixture into twelve, 3-inch diameter patties. If desired, cover and chill for up to 24 hours before cooking. In a large skillet, heat 1-inch of oil to 375˚. Add potato patties, three or four at a time and fry, about 2 minutes or until golden brown, turning once halfway through cooking time. Drain on paper towels. Serve hot and top with salsa if desired. 8 for 8 with Ronnie Fein! Eight Cookbook Authors for Eight Days of Chanukah. Welcome to the 8 for 8 series in honor of Chanukah 2014. We will be focusing on 8 cookbook authors, one for each day of the holiday. Let’s talk to these foodies and see how they celebrate Chanukah and what they are cooking, baking and enjoying! I do not promise that we will spell “Chanukah” consistently all 8 days. Ronnie Fein is a renowned cookbook author who literally wrote the Idiot’s Guides to Cooking. Ronnie has just released The Modern Kosher Kitchen (Fair Winds Press) with a forward by Jamie Geller. Ronnie’s new book focuses on creative and interesting recipes while not being intimidating. There is a lot of buzz surrounding the book which is really nice to see. I had the pleasure to work with Ronnie over the past year as she edited the new cookbook Gluten Free Around the World by Aviva Kanoff which I coordinated. (Aviva will be featured in 8 for 8 this week!). It is always terrific to work with such nice and professional people and I am grateful that Ronnie agreed to be part of 8 for 8 and I am thrilled to kick off the series by speaking with her. What stands out for you about celebrating Chanukah as you grew up? What about when you were raising a family? Do you have any special food memories? Chanukah wasn’t as important when I was a youngster as it seems to be today. Purim and Passover were the bigger holidays. Still, it was festive enough, but there weren’t elaborate preparations, special blue giftwrap and certainly not 8 days worth of presents. I do remember it as a special time because that’s when my Aunt Roz and Uncle Mac would take me, my brother Jeff and cousin Leslie ice skating. What a treat, especially the year we got satin lined skating outfits and our own ice skates for Chanukah! And of course we got gelt, chocolate of course, gold wrapped in mesh bags! We each got our own bag and I still remember clawing the wrappers open to get to the chocolate. Chanukah became a more celebratory event when I was raising my own children. There was more talk about it at school, even though the majority of children were not Jewish, in an effort to be more inclusive. So it more or less had become a well known Americanized holiday that everyone knew about, not just Jewish families. My husband Ed and I also gave the children 8 gifts, usually one or two big ones, the others that were just fun or silly. My kids were excited to open one each night to see whether it was the “good” one or not. And they still joke about the socks, which was always one of the eight. As for food – they also got gelt, same awful chocolate, same mesh bags. Has your Chanukah changed since you became a chef and author? Significantly. As I read more and more about Chanukah in order to prepare for my food articles, I learned about the historical events that preceded our celebration. More to the point, not only did I understand the Maccabee victory and what it meant for the future of the Jewish people, but I learned about the part that Judith played. Judith was a brave widow who lived in the town of Bethulia in Judea in the second century BCE. Who knows what the outcome would have been if Judith hadn’t dined with Holofernes, a general in the enemy’s army? She made him eat plates and plates of salty cheese, which got him thirsty and so he drank lots of wine and fell asleep, whereupon she decapitated him! When they learned their general was dead, the Greek army was confused and broken, allowing the Jews to launch their victorious attack. I have two daughters and it was important for me to tell them about a woman’s role in the victory. I retold the story every year and made sure that we had a cheese-oriented meal, in honor of Judith. Now I have three grand daughters and we still follow that tradition. Some say Shavuot is the cheese holiday, but for us, it’s Chanukah. What is Chanukah like with the Fein family? Our family is kind of tribal! We get together for every major holiday. My children and grand children sleep over, the kids play together and we eat lots of good food. I make fresh, hot, crispy latkes every year, no matter what else I cook. Cheese latkes and potato latkes and sometimes a new variety (last year it was sweet potato latkes with dried cranberries). For Chanukah we line the kids’ presents up on our hearth and on top of the pile we put that old classic, a mesh bag filled with chocolate Chanukah gelt. This year it will be a little different. I wrote an article for the Jewish Week on “gourmet gelt” – upscale chocolate coins. When our family got together for Thanksgiving, the older kids saw the boxes in my cabinet and were curious. They said they are expecting the “good” chocolate gelt this year! Most definitely. My parents didn’t know that Chanukah was originally a holiday on which people ate cheese. As a historical matter, centuries ago, the first latkes people ate to celebrate Chanukah were made with cheese. Unfortunately, many Jews in some of the northern countries such as Russia and Poland, were very poor and couldn’t afford cheese, so they made their latkes with potatoes. As Hillel says, “the rest is commentary.” Maybe not being able to buy cheese was not so unfortunate! 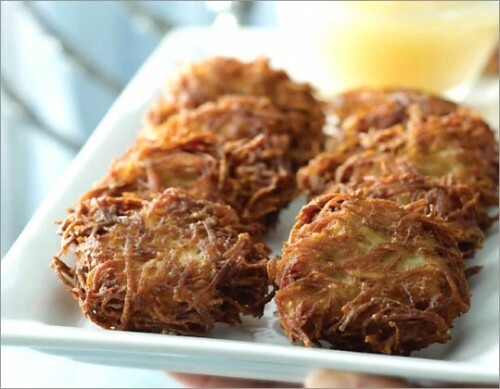 Can you imagine life or Chanukah without potato latkes?! I serve old fashioned dairy sour cream with the latkes (although some prefer applesauce) but over the years I have also created some interesting dips to go with the latkes, including an interesting tangy one made with plain yogurt and lemongrass. I always get questions about my challah, no matter what holiday and frankly, even when it isn’t a holiday. It’s a recipe I developed from my grandmother’s notes that had no real measurements and no instructions. I have to brag – it’s the best challah, the very best (it is the only traditional recipe in my new book). One of the most poignant, touching moments of my life came this year when my daughter asked me to bake the challah for my grandson Zev’s bar mitzvah. I will treasure that request to my dying day. I also get requests for rugelach, butter cookies and Grand Finale Cookies (in my book, Hip Kosher), which is a combination of chocolate chip and oatmeal-raisin cookies. These recipes are all available at www.ronniefein.com. Ach, it’s not even close. Potato latkes. Everything else is extra. I like sufganiot but fried potatoes? It’s my “what one food would you take to a desert island if you could only choose one” choice. Anyone who knows me knows I love modern food and have spent my life creating new recipes. But there is no food quite so delicious as potato latkes (and challah!). Preheat the oven to 425 degrees. Cook the water and butter in a saucepan over medium heat. When the butter has melted, add the flour and salt all at once. Stir vigorously with a wooden spoon until the mixture is well blended and begins to come away from the sides of the pan. Remove pan from the heat and let the mixture cool for 2-3 minutes. Beat in the eggs one at a time, blending well after each addition. * Add the herbs, cheese and cayenne pepper and blend them in thoroughly. *Incorporating the eggs is what most people find difficult. Be sure to add them one at a time. Use a sturdy wooden spoon to help you. The mixture will be sticky and at first you think it will never come together, but keep mixing and you’ll see that it does come together. After each egg is incorporated the mixture becomes softer and pastier and stickier. That’s the way it’s supposed to be.